Spathatoi, medium swordmen, are the sword arm of the Skutatoi. The main difference they have with them is that instead of a Kontarion spear they yield a one-edged sword, sligthly curved like a scimitar and worn at the waist, called “Paramerion”. Spathatoi wore a reinforced iron or bronze helmet with both a scale or leather aventail and also a scale or mail gorget. As armor they wore a “bambakion” padded cotton cloth gambeson (probably more than ¾ of an inch in width). Above that, a “klibanion” light lamellar corselet is worn reaching down up to the belt. They all carried a big triangular shield, emblazoned with geometrical shapes or lines. Fighting alongside the spear carrying Skoutatoi, they were used in the same way those were, but as they carried sword, they would be better suited at fighting infantry, instead of the cavalry that was the role of the Skoutatoi, and later on Kontaratoi. Later on, the improving state of the empire and technological improvement in armaments, led to the introduction of Vestiaritai heavy swordmen in large numbers, as before that they were only household treasury guards. 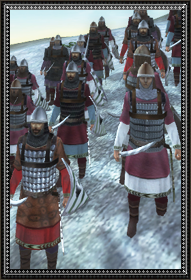 Spathatoi, however still retained their role of flank guards, especially guarding the shieldless Kontaratoi pikemen. The real power behind the Eastern Roman Army wasn’t its shiny Kataphraktoi or Stratiotai. It was the Skoutatoi spearmen and their brethren Spathatoi swordmen. They were a solid infantry unit which became the backbone of all Roman armies during the renaissance of its might in the 9th and 10th centuries. Now, after the devastation brought upon the empire by the Turkish occupation of the Anatolian provinces, the fight against the Normans and Bulgarian rebels, their equipment suffered as well with boiled leather replacing metal. Manuel Komnenos and his predecessors managed to reverse the trend, and now the empire is at the verge of expansion. And not a moment too soon as the need for a medium swordman is great within the Roman ranks. All its neighbours field equal or better swordmen or axemen. Romani tradition of fighting with sword and shield (much like the legionaries of yore) reigns supreme, and until better swordmen become available the spathatoi must fight and must win, but within their limits, or they will rout.